Cachet (ka - shay) - text or drawing applied to a First Day Cover envelope describing the new stamp(s). Cameo - nickname given to Canada's definitives of 1962-1966. Canadian Bank Note Company - a printer of Canadian stamps. Some cancels are applied by hand, others by machine. Caricature - nickname given to Canada's definitives of 1973-1977. 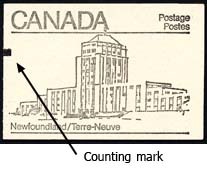 CBN - acronym for Canadian Bank Note Company, a printer of Canadian stamps (see above). CDS - acronym for circular date stamp. See 'Socked on the nose'. Cello-Paq - a miniature pane (either 1 or 2 panes) of stamps enclosed in a sealed, clear plastic wrapper. Introduced in 1961 with the Wilding definitives. Cello-paqs appeared in the Wilding, Cameo, and Centennial definitive series. In addition, several Christmas issues, starting in 1964, have appeared in this format. 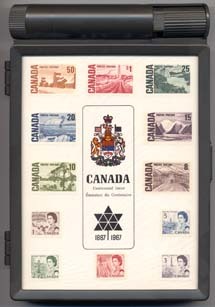 Centennial - nickname given to Canada's definitives of 1967-1973, issued first in 1967 - Canada's centennial anniversary. 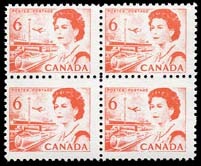 This series has become one of Canada's most popular and researched set of stamps. BNAPS has a Study Group devoted entirely to this series. Centennial stamp box - souvenir display case and box targetted to stamp collectors in 1967. Centering - the relative position of the design of a stamp to its edges. Centering is an important part in determining the condition (see below) and value of a stamp. Chewing Gum booklet - single row of three stamps stapled into a booklet about the size of a flat stick of chewing gum. Clark - a manufacturer of paper used on Elizabethan-era stamps. First seen in December 1983; not used very long. Coated - stamp paper showing a shiny gleen across its surface, as opposed to non-coated. Coated Papers Limited - a manufacturer of paper used on Elizabethan-era stamps. First seen in December 1990. The company name was changed to Tullis Russell Coatings in January 1998. The gum typically has a slight blue-green tinge. Coil -a stamp issued to the public in a long roll. The stamps are wound in the form of reels, rolls, or coils, sometimes for insertion and use in stamp-vending or affixing machines. The coils of the early Elizabethan era (1952-1968) were issued in rolls of 500. From 1968-2000 all rolls consisted of 100 stamps. In 2000, self-adhesive coils became the norm and rolls of either 100 or 50 have been issued. Coils are commonly collected in pairs or strips of four. 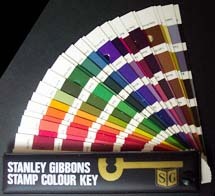 Colour guide - folding card (or similar) on which all the principal philatelic colours are shown and named. Comb perforation - the application of perforations to three sides of the stamp in one stroke (T-comb). This can fall into three main groups: single row, multi-row, or the entire pane (Harrow perforation). H-comb (or "Chambon") perforators apply perfs to one row of stamps and half-legs to the rows above and below. 1- and 2-row H-comb perforators are common. The type of perforator can sometimes be seen by viewing the alignment of perforations. This can become important when studying various perforations shifts and errors. Combination cover - a First Day Cover that has more than one stamp design on the same theme, issued on the same day, whether the different designs are on several panes or all on one pane (se-tenant). Commemorative - a stamp issued, usually for a limited period of time, to mark a particular event or anniversary, as distinct from a definitive. 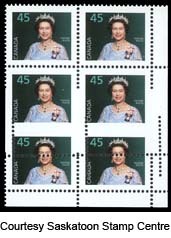 Condition - the state of the stamp as measured against the finest examples of the issue concerned. 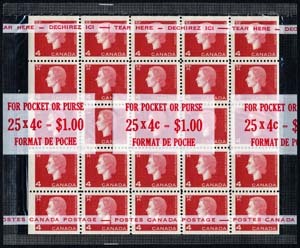 Condition applies to the state of the paper, colour, perforation, margins, gum, and cancellation. Condition is the all important factor in determining the value of a stamp. Constant - a variety that occurs regularly in the same position on the sheet throughout one or more printings of a stamp. Corgi Times - bi-monthly journal of the Elizabethan II Study Group. Named after the breed of dog (corgi) which is a favourite of Queen Elizabeth II. Click to view these journals. Counterfeit - any stamp made expressly with the intent of defrauding a postal administration of revenue. Counting mark - printed mark on the folded edge of a booklet used for quick counting of stock. Cover - any type of covering for any kind of matter sent through the mail. 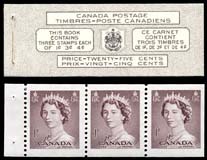 CPS of GB - Canadian Philatelic Society of Great Britain. Studies all aspects of philately in British North America. Journal is called Maple Leaves. 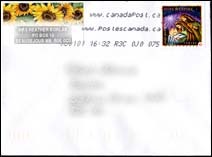 Crease (pre-printing) - a crease in the paper prior to printing the stamp, which, when un-'folded' shows an "unprinted" portion of the stamp design. Cut square - the stamp indicium (stamp imprint) of an envelope or postal card (or some other form of postal stationery) that has been cut from its entire into a square. These have a fraction of the value of the entire, particularly on modern stationery where a cut square will have practically no value.